La-La Land Records, Tri-Star Pictures and Ghost House Pictures present the original motion picture score to the 2013 feature film Evil Dead, starring Jane Levy, Jessica Lucas and Shiloh Fernandez, and directed by Fede Alvarez. 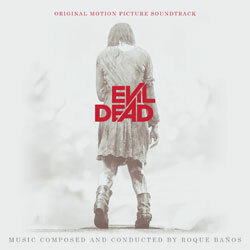 Acclaimed composer Roque Baños (The Machinist) creates a heart-stopping thrill ride of a horror score that launches this all-new re-imagining of the original The Evil Dead into the Horror Hall of Fame alongside its legendary predecessor. The Evil Dead soundtrack will be available for digital download at iTunes and other digital music retailers on APRIL 9th. Also on APRIL 9th, the DELUXE CD EDITION of the soundtrack, featuring more than 25 minutes of additional music NOT present on the digital download release, will be available to order from www.lalalandrecords.com and other online soundtrack boutiques. This CD will become available at Amazon and other major online retailers MAY 7th.